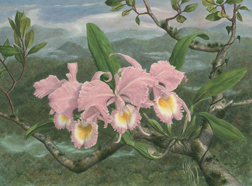 Orchids are viewed by the public and many new hobbyists as very exotic plants; difficult to grow. There are certainly many orchid species that fit that category. However, most orchids given as gifts designed for the mass market are very easy to grow if one remembers the “KISS” principle. This axiom (keep it simple stupid) works well for those of us that like to think that we have advanced beyond beginner status too. The following is my list of orchid growing rules that follow the “KISS” principle. Pass this list on to friends who receive an orchid gift this season. 1. Water only when dry. Even if you under water, your orchid will not die. Over-watering kills roots, degrades the potting medium and attracts insects. All of these problems are difficult to reverse even for experts. Under-water your orchid, and one simply needs to water more frequently and your orchid will grow and flower. 2. Under-fertilize or don’t fertilize. Every orchid growing manual recommends a particular nutrient formula or brand. Newly purchased orchids usually come in a medium loaded with nutrients (fertilizer). Many new orchid growers purchase “orchid” fertilizer with their plant and feel obligated to use it regularly. Few orchids die from being under-fertilized, but many die from too much fertilizer. Over fertilizing is the second leading cause of death of orchids, often accelerated when the orchid starts to show signs of stress from over-watering. 3. Repotting. As soon as an orchid begins to look stressed many growers decide to repot. If over-watering and over-fertilizing have not killed your orchid, this will usually finish the job. Repotting can save an orchid if the first two rules have been violated, i.e. roots are dead, and the medium shot. Rarely, however, is this effort successful once this stage is reached. There is a greater chance of success if the mistreated orchid and its medium is carefully transferred to a clay pot of the same size and allowed to dry thoroughly. Most orchids come in a plastic pot, often poorly drained, and sometimes have no drainage at all. 4. Use the water you have! Buying mineral water or distilled water may make you feel better, but it generally offers no better chance of survival for your orchid than water from the tap. Some folks have even installed water softeners for their orchids; a sure-fire death warrant. Good water quality is extremely important, but not critical for most orchids. Thoroughly soak your orchid at least once a month. This can involve setting your orchid in a sink full of water for 15 minutes or so or allowing water to run through the pot for awhile. This removes any salts, including excess fertilizer. Use water at about the same temperature as the air. 5. Humidity Many beginners insist of misting their plants constantly to maintain a proper humidity and provide water. Often this seems necessary because some aspect of rules 1-4 above have been violated and the orchid appears to be wilting or suddenly drops all of its flowers and buds. If humidity is kept at the ideal for people, 50-60%, your orchids will lose water at an appropriate rate. Consider the location of your orchid and if you would be uncomfortable there, so would your orchid. 6. Light Orchid books spend lots of time describing the ideal light environment. All plants need light to grow. However, orchids can adapt to a variety of light conditions and grow and flower there. They cannot grow in the dark. Orchids in windowsills often experience bright light for short periods of time and then low light levels for the rest of the day. As long as leaves do not become hot to the touch, this setting is appropriate as long as one does not violate rules 1-5 above.